Lately, my new favorite activity on Saturdays is baking. After sleeping in (of course) and avoiding normal daily responsibilities (ie. showering, exercising, practicing music for the next week at work), I like to spend the first half of my day with a baking project. Three weeks ago it was French macarons and since today is the last day of Passover, I thought I'd tackle the other macaroon: the coconut macaroon, which is the ubiquitous Passover treat. 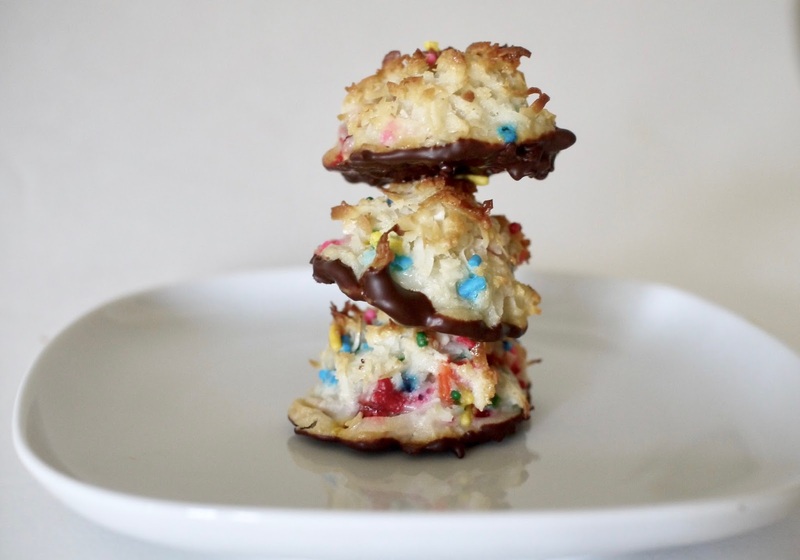 My fascination with macaroons started in middle school when my friends would bring them to school during Passover. I then asked my mom to buy them at a local bakery and I even have a hazy memory of having her buy the canned version at the grocery store. But after all these years, I never tried to make my own and I honestly can't remember the last time I ate one. I turned to Molly Yeh's Funfetti Macaroons, which aren't the traditional ones I ate in my youth but the funfetti flavor adds a little whimsy to these goodies. And one bite in, I was immediately taken back to the mid 90s with the punch of coconut and chocolate and the chewy yet crispy texture. 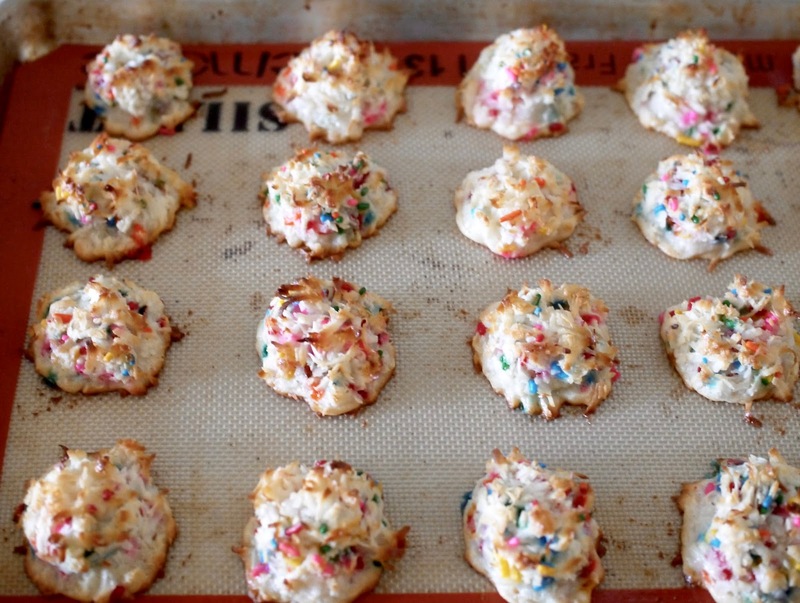 But the almond extract and the sprinkles also reminded me of boxed Funfetti cake. Yum. These are WAY less labor intensive than French macarons so I can almost dub this as a lazy Saturday baking project. 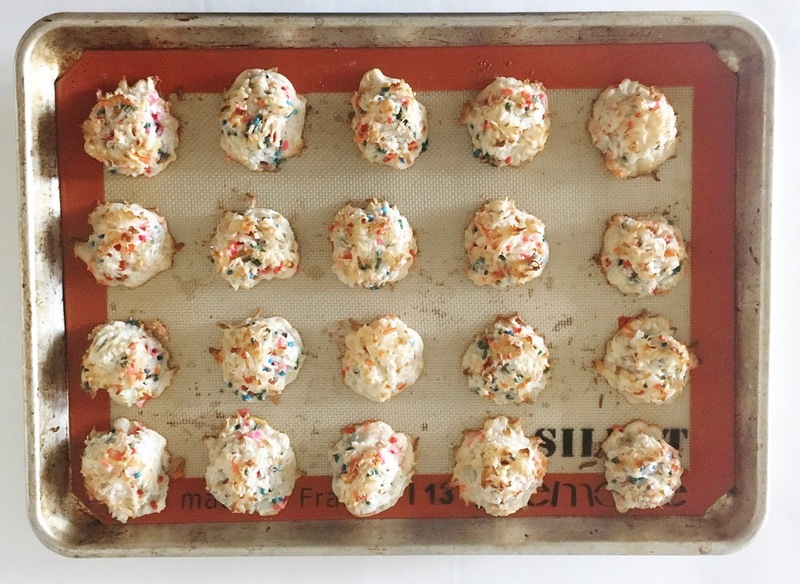 The Recipe: Funfetti Macaroons from My Name is Yeh. I kind of agree with Molly's husband---adding sprinkles to the chocolate bottoms yielded too many sprinkles. So I kept the majority of the chocolate coating sprinkle-free.